P.T., the brilliant playable trailer for Silent Hills, continues to deservedly attract obsessive study. One of the demo's mysteries is a radio transmission in a foreign language. If these fans are correct, it's in Swedish, and seems to make a major revelation about the game. Let your ears listen, to the radio. Can you hear your own soul's scream? Well, what do you choose? Wise as you are you might already have discovered it. 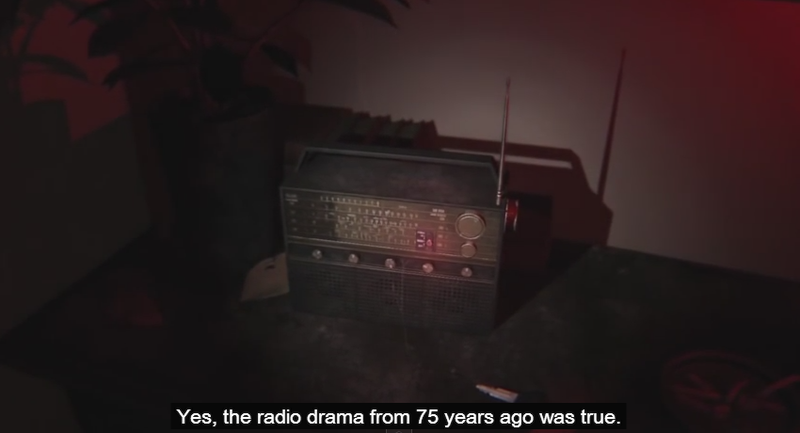 Yes, the radio drama from 75 years ago was true. They are here on our earth and they monitor and see all. Don't trust anyone. Don't trust the police. They are already controlled by them. That's the way it has been for 75 years now. You have a right. A right to become one of us. So, welcome to our world. Very soon the gates to a new dimension will open. The War of the Worlds was broadcast in 1938, approximately 75 years ago, and thus the transmission seems to indicate that the enemies in Silent Hills are aliens. That wouldn't be out of character for the franchise, which has often involved aliens. A small town overrun by horrific, sanity-destroying aliens also sounds a lot like the type of setting Guillermo Del Toro must have studied while working on a movie based on H.P. Lovecraft's At The Mountains of Madness.